The Beth Hamedrash Hagadol synagogue on 16 May 2017. Image Source: Charles Eckert/AM New York. 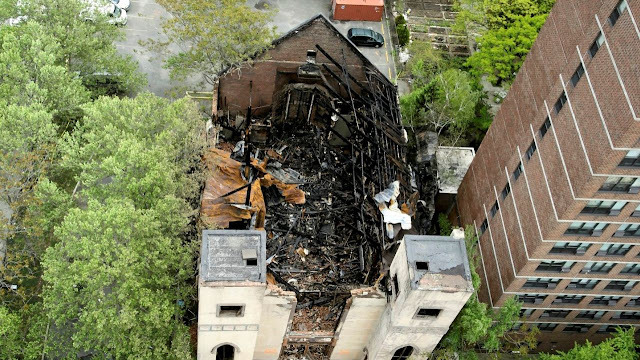 What disturbed me most in this hideous morass was a fire at the Beth Hamedrash Hagadol synagogue on the Lower East Side of Manhattan, late on 14 May 2017. Built in 1850 as a Baptist church, it became in 1885 the oldest Ashkenazi synagogue in Manhattan and served the first immigrants to arrive from Eastern Europe. It was closed to its congregation in 2007. The neighbourhood is now mainly Chinese American. "An April report from the Anti-Defamation League (ADL) concluded that 541 anti-Semitic incidents have occurred so far [in the USA in] 2017, an 86 percent increase compared to the same time period in 2016. ThinkProgress conducted its own assessment of hate incidents across the country earlier this year, beginning with Trump’s election and ending in early February. Our report found that Jewish groups were disproportionately impacted by acts of hate, including attacks on Jewish houses of worship." Neo-Nazism and white nationalism are getting more blatant and open on the Internet every day. I have never seen such creepy, 1930s'-styled racial rhetoric in contemporary sources, and outside historical texts. Guys I've had to take the JQ video down again because I'm being threatened with legal action in the UK. Please do not mirror that video. For example, on 15 May 2017, according to its author, a Youtube video on the Jewish Question was flagged for removal. Beneath the video, commenters argued whether the maker of the video - ethnic white nationalist, Tara McCarthy, aka Reality Calls - has the right to lead racial discussions because she descends from an "admixture" of white lineage! On 15 May 2017, McCarthy responded to her viewers: What's it like being a mixed race ethno-nationalist? In her measured tones, McCarthy reveals the shocking degree to which 1930s' terms have been revived and normalized. Below her alt-right video, see two other videos which reveal the tone of anti-alt-right opposition, all in the same week. The alt-right: What's it like being a mixed race ethno-nationalist? (15 May 2017) Video Source: Youtube. The opposition: the ethnic nationalists and Trump's electoral victory have spawned a violent anti-fascist movement. Student FREAKS Over Trump Sign On Campus. (12 May 2017) Video Source: Youtube. The man's sign reads: "The right to openly discuss ideas must be defended." ANTIFA attacks a man holding a free speech sign (Dalston, UK). The context of the protest is unclear, due to the video's editing. (Uploaded: 12 May 2017) Video Source: Youtube. There must be a way to restore decency and consensus in political discussions, because accusations and mud-slinging encourage extremism on the right and left. When extremists seize control of the public sphere, moderates cannot solve serious problems. There are partial truths; silenced witnesses; cover-ups; anti-democratic trends masquerading as pro-democratic movements; crime and corruption; disinformation, censorship and spin in all branches of the media. There is an incredibly dangerous, growing racist narrative confronting radical suppression of freedom of speech. Intolerance counters intolerance. People in the grip of polarized perspectives insist they and their favoured camp are unambiguously and absolutely correct, while everyone else is evil and must be threatened, persecuted, prosecuted and condemned. Polarization heightens extremes at the expense of the centre and of moderate voices. Meanwhile, there is the basic measure of the situation, as a synagogue goes up in flames. 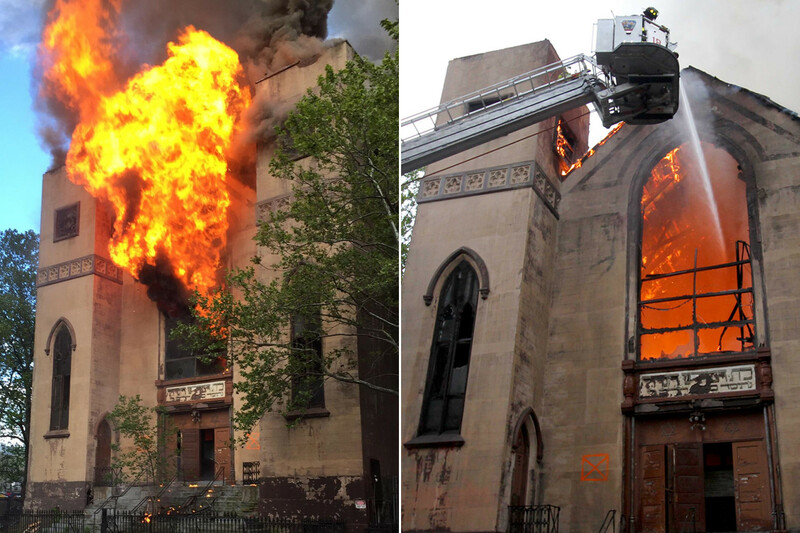 CBS New York: Fire Burns 110-Year-Old NYC Synagogue (15 May 2017) Video Source: Youtube. FDNY RESPONDING TO & BATTLING A 3RD ALARM FIRE AT THE ABANDONED BETH HAMEDRASH HOGODOL SYNAGOGUE. (15 May 2017) Video Source: Youtube. "'I don't think ... [I] want to write any political songs ... . I don't think the answer's in politics or religion. The answer is inside people themselves, really, which is a much bigger question. It's not one person who's going to lead us into the light. It's going to have to come from us, so who knows what will happen or not?'"